Apr. 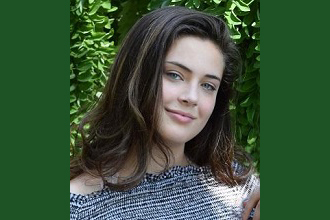 10, 2019: Six Bronxville High School students performed with the Organization of American Kodály Educators’ National Conference Choirs, a high-quality choral program featured at the annual OAKE National Conference in Columbus, Ohio, from March 20 to 23. The national conference, which brought together well-known educators and conductors, culminated with a choral concert on the final night of the conference. The students were selected through a rigorous audition process. Sophomore Michael Weild performed with the chamber ensemble, which performed nine pieces, all a cappella, under the direction of esteemed Hungarian conductor Peter Erdei. Junior Alice O’Connell, sophomore Caroline Palermo, and freshmen Eliza Brennan, Maggie Lockwood, and Anna Maicon performed with the concert women’s choir, which performed under the direction of conductor Andrea Solya. The Organization of American Kodály Educators holds a conference in a different city each year. The organization aims to support music education and promote universal music literacy and lifelong music making. 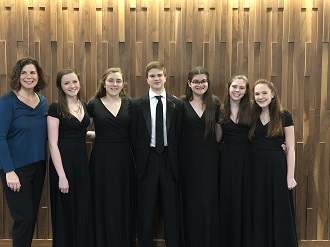 Pictured here (L to R): Choral director Pamela Simpson and students Alice O'Connell, Caroline Palermo, Michael Weild, Anna Maicon, Eliza Brennan, and Maggie Lockwood.